The best and worst thing about living in New Zealand is that Christmas is in the middle of Summer. It means that all the snowman, sleigh and woolly coat references are completely irrelevant. Our poor Santas sit in shopping malls boiling up in big red coats while everyone else is in shorts and t-shirt. Sweaty Santa - good look. However it means that after Christmas lunch we can lay in the sun in a semi-conscious slumber. Or go for a walk on the beach, or run around playing Rugby (HA, well maybe not me for that last one). Anyway, so I felt a bit silly doing snowflakes for today's challenge, but it had to be done! I actually really like this design, and painting snowflakes in general. They look like nothing and then all of the sudden they look so intricate and pretty! This is my easiest nail art tutorial for Christmas this year so far, so I'd definitely recommend it. Here's the tutorial! Please subscribe to my channel - I have a whole playlist of Christmas designs and heaps of other ones too. My nails are slowly getting stained again from all this polish. They were so lovely before! Oh well, I'll try give them a break after this challenge is over and they'll clear up before long. I really like the gradient effect in these nails! It kind of gives the appearance of snowflakes falling from a clear blue sky into a field of snow. So, is your Christmas in Summer or Winter? What's the average temperature? This is so cute! 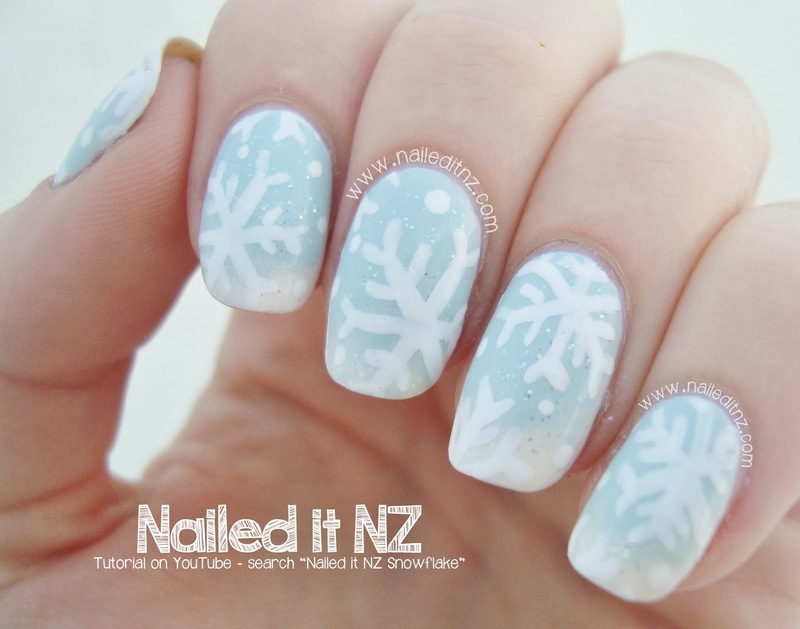 I always find it hard to do snowflake nails but your tutorial really helps! I agree the gradient does make it look like the snowflakes are falling! 33ºC over hear...it's next to impossible using nail polish (damn bubbles) unless you are in a room with air conditioning. Your mani is refreshing, I love the gradient!